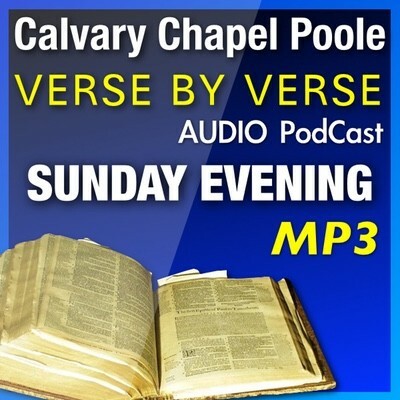 These verse-by-verse study notes on the Gospel of John (chapters 11-21) were compiled following the teaching sessions by Pastor Barry at Calvary Chapel Poole during 2009. These verse-by-verse study notes on the Gospel of John (chapters 1-10) were compiled following the teaching sessions by Pastor Barry at Calvary Chapel Poole during 2009. This verse by verse study of John chapters 20-21 was taught by our Pastor, Barry Forder, at Calvary Chapel Poole on the 29th November 2009. This verse by verse study of John chapters 18-19 was taught by our Pastor, Barry Forder, at Calvary Chapel Poole on the 25th October 2009. This verse by verse study of John chapter 17 was taught by our Pastor, Barry Forder, at Calvary Chapel Poole on the 20th September 2009. This verse by verse study of John chapter 16 was taught by our Pastor, Barry Forder, at Calvary Chapel Poole on the 13th September 2009. This verse by verse study of John chapter 15 was taught by our Pastor, Barry Forder, at Calvary Chapel Poole on the 6th September 2009. This verse by verse study of John chapters 13-14 was taught by our Pastor, Barry Forder, at Calvary Chapel Poole on the 30th August 2009. This verse by verse study of John chapters 11-12 was taught by our Pastor, Barry Forder, at Calvary Chapel Poole on the 26th July 2009. This verse by verse study of John chapters 9-10 was taught by our Pastor, Barry Forder, at Calvary Chapel Poole on the 28th June 2009.